A glacis (; French: ) in military engineering is an artificial slope as part of a medieval castle or in early modern fortresses. They may be constructed of earth as a temporary structure or of stone in more permanent structure. More generally, the term glacis can denote any slope, natural or artificial, which fulfils the above requirements. The etymology of this French word suggests a slope made dangerous with ice, hence the relationship with glacier. 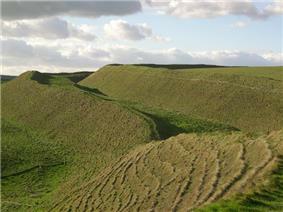 The ramparts and ditches of Maiden Castle. A glacis could also appear in ancient fortresses, such as the one built at Semna, by the ancient Egyptians. Here it was used them to prevent enemy siege engines from weakening defensive walls. Ancient British hill forts started to incorporate glacis around 350 BC. Those at Maiden Castle in Dorset were 25 metres (82 ft) high. 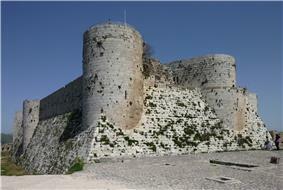 Crac des Chevaliers: the south face of the inner ward with its steep glacis. Glacis were incorporated into medieval fortifications to strengthen the walls against undermining, to hamper escalades and so that missiles dropped from the battlements would ricochet off the glacis into attacking forces. Towards the end of the medieval period some castles were modified to make them defensible against cannons. Glacis consisting of earthen slopes faced with stones were placed in front of the curtain walls and bastions (towers) to absorb the impact of cannon shots or to deflect them. Towers were lowered to the same height as the curtain walls and converted into gun platforms. Early modern European fortresses were so constructed as to keep any potential assailant under the fire of the defenders until the last possible moment. 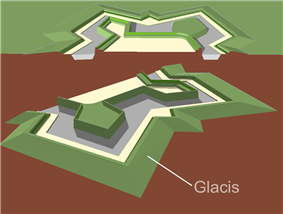 On natural, level ground, troops attacking any high work have a degree of shelter from its fire when close up to it; the glacis consists of a slope with a low grade inclined towards the top of the wall. This gave defenders a direct line of sight into the assaulting force, allowing them to efficiently sweep the field with fire from the parapet. Additionally, but secondarily, the bank of earth would shield the walls from being hit directly by cannon fire. Though defenders on a high ground already have a direct line of sight, a glacis allows defenders to sweep the field more efficiently by minimizing changes to the angle of their guns while firing. Furthermore, the glacis prevents attacking cannons from having a clear shot at the walls of a fortress, as one usually cannot even see the walls until the glacis is crossed and the ditch, bounded on either side by the smooth, masoned scarp and counterscarp, is reached. The term glacis plate describes the sloped front-most section of the hull of a tank or other armored fighting vehicle. In a head-on-head armored engagement, the glacis plate is the largest and most obvious target available to an enemy gunner. Anti-tank mines which employ a tilt-rod mechanism are also designed to detonate directly underneath the glacis plate. As a result, the glacis plate is generally the thickest, most robust armored section of a tank, followed by the turret face and mantlet. An erosional or depositional landform, with little slope. Erosional glacis occur mostly in arid regions, and result from intense weathering and surface transport via laminar, episodic water flow. ^ Dyer 1992, p. 19. ^ Decaëns & Dubois 2010, p. 17. ^ Stokstad 2005, p. 84. ^ "The Terminology of a Fortress:Glacis". www.fortadams.org. Retrieved June 2014. ^ "Glacis plate". Encarta Online Dictionary. 14 December 2008. Archived from the original on 31 October 2009. Decaëns, Joseph; Dubois, Adrien, eds. (2010). Caen Castle: A Ten Centuries Old Fortress (illustrated ed.). Publications du Crahm. p. 17. Dyer, James (1992). Hillforts of England and Wales. Shire Series 16 (illustrated, revised ed.). Osprey Publishing. p. 19. Stokstad, Marilyn (2005). Medieval Castles. Greenwood guides to historic events of the medieval world (illustrated, annotated ed.). Greenwood Publishing Group. p. 84.